What Experiences Are Your Prospects Looking For Online? As marketers we’re always interested in what experience prospects are looking for when they go online. AOL recently asked more than 50,000 people this very question. They polled individuals in eight countries including the United States, Brazil, Germany, Italy, Japan, the United Kingdom, Canada, and Spain. 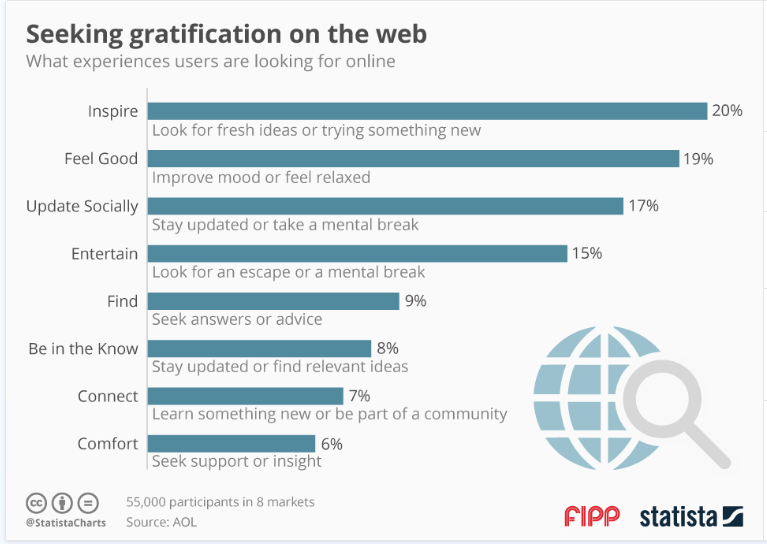 Researchers boiled the responses down to eight so-called content moments or experiences users want when they log on. The infographic below illustrates the results AOL found from the survey. As you can see, most prospects go online to be inspired, feel good, and see fresh ideas. Consider keeping this in mind as you develop your digital content and strategy. I came across this article by my colleagues at Spectrio and wanted to share it with you. As a brand, you should have influence over each interaction a customer has with your business. You should consider every possible situation that could bring your customer into contact with your brand and design that scenario to deliver a positive experience. And for that, there is touchpoint mapping. Before we look at touchpoint mapping, we need to look at what a customer touchpoint is. A customer touchpoint is any interaction between your business and a customer. It includes any interaction before, during, or after a customer purchases something from you. A customer touchpoint happens through personal interactions and marketing channels. The interaction may be direct where you control the experience (such as a delivering a marketing message or ad campaign). Or, it could be indirect and you don’t have control over the experience (such as a word-of-mouth review of your business). While you may not have complete control over every customer touchpoint, as a business owner, you still want to do your best to influence each situation. The best way to develop a plan to manage these interactions is through touchpoint mapping. Touchpoint mapping is the act of outlining each interaction that a customer could have with your brand. It looks at each step of the buyer’s journey and identifies the places where customers come in contact with or experience your brand. Touchpoint mapping is important because it allows your brand to visualize and improve every experience a customer has with your business. Because no customer buyer’s journey is exactly the same, each brand will have multiple variations of touchpoint maps. To create your maps, consider all of the possible ways people experience your brand and use the following process. Now that you know what customer touchpoints and touchpoint mapping are, it’s time to implement a strategy for using this marketing method. To start touchpoint mapping, begin by identifying each interaction that your business has with your customers. It helps to look at the experiences in categories: before purchase, during purchase, and after purchase. Once you have identified the places where your customers interact with your brand, begin to place these experiences in chronological order. As you go through touchpoint mapping, consider the steps that lead your customers through the purchasing process. Use the phases of a retail buyer’s journey to guide your outline. Step One — Making Customers Aware of Your Brand: The customer is becoming familiar with you brand and products. Step Two — Getting Customers Through the Door: The customer is familiar with your brand and is planning a visit to your physical store. Step Three — Initiating Sales: The customer is in your store and is working through their purchasing process. Step Four — Getting Customers to Come Back: The customer has made a purchase and is considering coming back and purchasing from you again. Don’t create just one buyer’s journey that goes through this process. Create at least 4-5 different types of customer maps to consider all of the different experiences your customers may have. Once you identify each possible customer touchpoint, the next step is working to improve the interaction. You need to look at how you can provide the best possible experience for the customer at that moment. Simple: The experience should be easy for the customer to understand and interact with. Appropriate: The experience should fit the context of its channel and interests of your target audience. Relevant: The experience should match what the customer would expect and need to find during that phase of the buyer’s journey. Meaningful: The experience should provide significant and useful value for the customer. Appealing: The experience should tap into the cravings of the customer and give them the things they desire. Look at each touchpoint and ensure that it has the qualifications of an exceptional and useful customer experience. Touchpoints for marketing and advertising don’t end once you create and implement your new strategy. Marketing channels and your operational processes will continue to evolve and change. So, your customer mapping must do the same. A customer touchpoint map is a work in progress. You will need to continue to revise and update the touchpoint map as new purchasing paths are created and new marketing platforms are introduced. 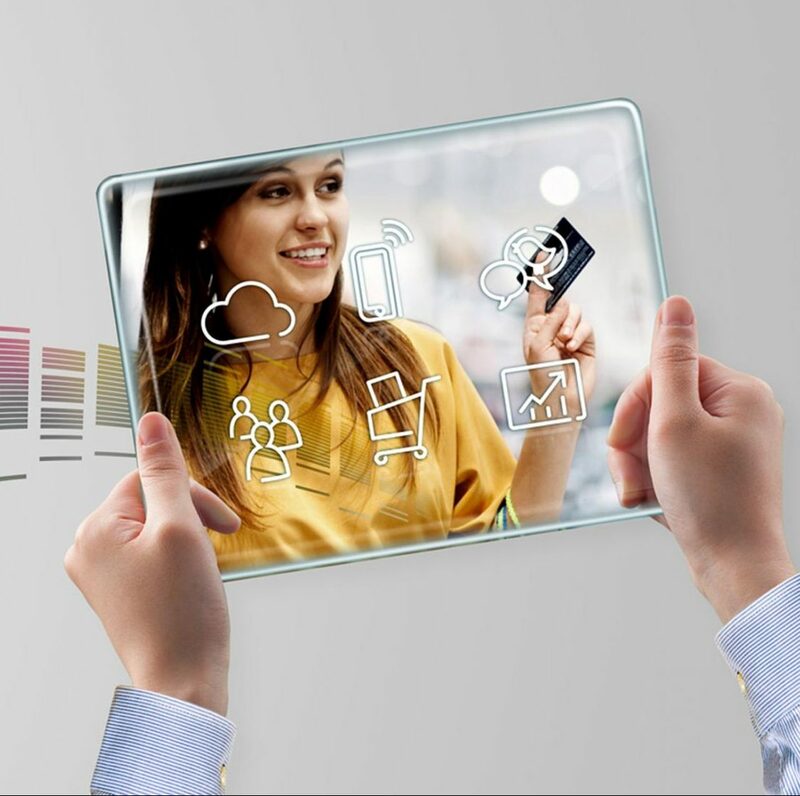 To effectively use touchpoint mapping as a way to create better customer experiences, you need to make it a continual priority. It will likely fail to produce results if you approach it as a one-time strategy. So put in the up-front work, and then set a plan to execute and continue to refine your touchpoint mapping to get the best benefits and results. If you want to start improving your touchpoint mapping right now — start by doing an audit of your current customer touchpoints. Use the free customer experience retail audit worksheet from Spectrio to conduct a review of the major touchpoints that customers experience inside and outside of your store.